Impulse Sealer: What are they and why you should get one? If you’re relatively new to bag sealing or are starting up a business or opportunity whereby you can benefit from plastic bag storage, transport or even customer dispatch, you may already be aware of the different types of heat sealers available on the market. While there may be many ways in which you can seal plastic or similar material together to form pouches, packets and bags, Spirepacks specialise in providing impulse sealer equipment to businesses and private individuals alike. An impulse sealer provides a short, precise and direct burst of heat, and unlike direct heat sealers – which provide constant heat and pressure throughout their being powered up – impulse sealers require little in the way of setting up or powering on time, meaning that they are easy to use and ready to work as soon as you are. For anyone working in a busy production environment or facing a large amount of orders within a short period of time, an impulse heat sealer is ideal for both efficiency and effectiveness. Why Use an Impulse Sealer? Using a heat sealer is not only quick, efficient and effective for small-scale jobs once you’re comfortable with using the equipment, but impulse plastic sealer equipment is also extremely durable as well as compact – making them handy to store and use as and when required. 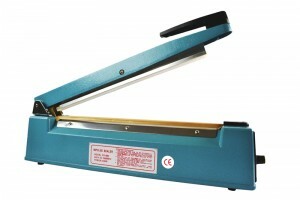 While some industries and commercial operations may opt to use larger machinery and heavy-duty heat sealing to complete the task, an impulse heat sealer is perfect for anyone who is keen to start sealing plastic on their own terms – be it part of a personal project or for self-employment purposes. Another huge benefit of taking advantage of an impulse sealer is that many of models for sale here at Spirepacks come fitted with middle or side cutting devices, making it easy for you to measure and cut custom-sized bags to seal from rolls of plastic or similar material with ease. While some commercial or heavy-duty equipment may require you to adhere to a ‘one size fits all’ approach, an impulse sealer with cutter allows you to easily and seamlessly create your own size of bags within an extremely short space of time. Impulse plastic sealer equipment – in general – provide what we find to be the most effective and durable solutions in heat sealing bar none. Spirepacks are a premier destination for all things heat sealing online – and with thousands of products in stock, we have the expertise and professional know-how to help you choose the right impulse sealer to get the job done. With warranties on our product lines and replacement sealer parts available for any existing equipment or tools you may have – or, should the worst occur, and you need to replace one or two components years down the line – you can be assured of a comprehensive and reliable approach to bag sealing. If you’re just starting out in the world of bag sealing and are looking for advice on the best impulse sealer for you, if you need heat sealer parts or would like to order from our catalogue directly, why not contact Spirepacks today? You can contact us via our web form below, or call us on 01246 860200 for helpful advice and all the information you need.